Yamaha's YPG-535 adds to their popular Portable Grand Series - and it's packed with a host of great features, especially for its affordable price. There's a 6-track sequencer onboard for immediate song-building, as well as a music database of 267 setups, listed by song title to get your creativity flowing - plus it uses Flash ROM memory, so you can easily download more songs to your YPG-535. Its 88-key design is lightly weighted for a more natural feel, and it has 500 XGlite/GM Voices, as well as a high-quality Grand Piano sample for realistic piano sound with your Yamaha YPG-535. You'll enjoy the YPG-535's onboard 6-track sequencer - great for capturing moments of inspiration, and building onto them right away. The YPG-535's Easy Song Arranger feature actually allows you to remix MIDI files so you can play them your own way, while the the YPG has 500 quality XGlite/GM voices for even more expressive playing, complete with a Live! Grand Piano stereo sample. You can use layer and split modes to further enhance your sound - playing bass notes with your left hand, and controlling a string section with your right. And, once you've gotten the parts sequenced perfectly, you can easily save the song to your computer via USB - or just pop in a portable USB thumb drive to take your project with you in your pocket! This YPG-535 features the Yamaha Education Suite that gives you interactive lessons to develop your piano skills and even monitors your progress. It has 30 internal songs, with 70 more on CD, so you can play along with more challenging pieces, while practicing your playing "in time." Its Flash ROM memory also lets you download more songs - and you can even connect a USB thumb drive to the YPG-535 to add your favorite MIDI songs so you can then learn them using the keyboard's educational tools. You can use the YPG-535 as a portable MIDI controller to create complex songs using your favorite software sequencing program. Also, you can easily load in MIDI songs, or save your own projects via USB. From beginners to the most seasoned players, the YPG-535 is a great go-to portable piano. It has a pitch bend wheel and sustain pedal jack that allow for expressive playing of its 500 XGlite/GM voices, and its 2-way stereo speakers, complete with bass ports, are right onboard so you can get playing immediately - plus it has a headphone jack for times when noise might be an issue. 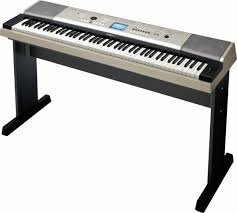 The YPG-535 comes with a stand and sustain pedal as well as an AC adapter so you can play all day and all night. 500 XGlite/GM Voices, 8 Sweet!, 3 Live!, 5 Cool! The Yamaha YPG-535 is a great portable keyboard with 500 different sounds!